I’ve been rubbish with my posts lately. 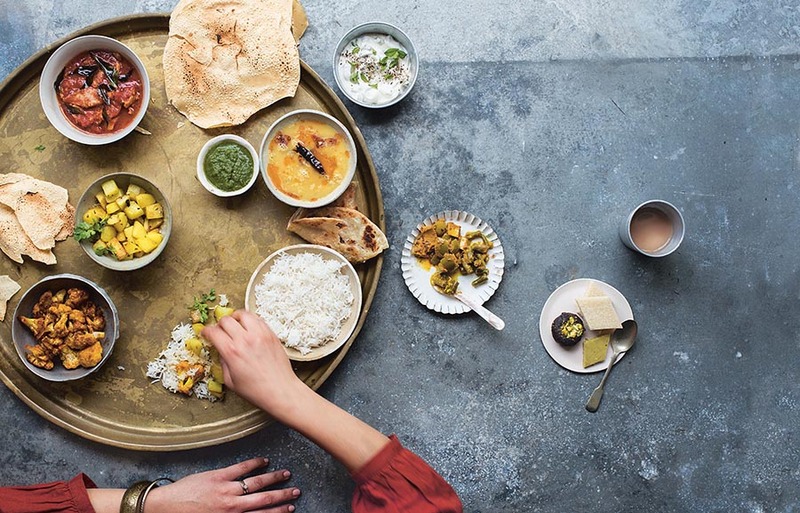 The kitchen has been churning out some lovely Indian recipes, but writing them up has proved to be tricky. Big night on Thursday, bigger night on Saturday with barely enough time to recover in between. Now to get back to matters of great importance – quick Indian cooking. Did I read about someone’s potluck party? This caught my attention. I have a great vegetarian recipe from my mother. It’s great for any party, but especially for a potluck because it’s economical, easy and wholesome. When my mother cooked this dhal with paneer all my party guests said it was the best dish of the evening. I haven’t invited them back since! Wash the lentils thoroughly. Put it in a pan full of plenty of water and bring to the boil. Boil on a medium flame to cook it. If it dries out, add more water. While it is bubbling away, chop the onion. In a little pan, heat the oil and fry the onions until light brown. Add the tomato puree and then the masalas (chilli, turmeric and coriander) and fry until the pungent smell goes. Add this to the lentils and keep cooking until the mixture is soupy. The lentils should be soft and squidgy when cooked. Now, cube the paneer and add it along with the frozen peas to the lentils. 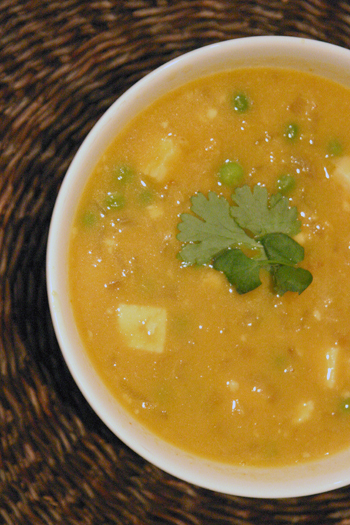 When the peas are cooked, your dhal with paneer is ready. Add salt to taste, stir in the raisins and enjoy with rice. Wow!! Peas, paneer and chana dal, a very unique combo indeed! I’ve never come accross such an amazing creation, and am totally tempted to give it a try now. Matar Paneer and Chana Dal are my favourites, and bringing them altogether in one pot is a genius idea. Hurray to your Mom! Hi Mallika – channa dal and paneer. This sounds like a great combination. Will try this soon. Hey Mallika, So good to see such a different post, never thought of using paneer and dal together. I will have to try it. Thanks a lot for sharing. Nidhi. I’ve often thought about this but never made it because it sounded too heavy! now the details..when do the raisins go in, and i don’t have any.. are they crucial? and this daal can’t be pressure cooked instead of boiled, no? till it’s squidgy, as you say? it’s YUMMY. i was so not sure when the peas were actually done though! Is this your style of cooking spice- seeds( mustard, cumin, fenugreek etc) are not added to seasoning oil or do you leave spice seeds out as they don’t necessarily add much to the final flavour? Curious. I did try your Sooji Halwa recipe, it a bit tricky and the sugar caramelises into hard candy instantaneously. I’ve had add water and cook it on low flame retain the glorious caramel color. Water tastes better than milk in this halwa. I did try out your moong dal recipe. It rocks!! There are raisins in the ingredients, but no mention of them in the cooking directions. Can you tell me when they go in? Hi Polly, sorry for that. Now amended. Thanks for bringing it to my attention! I still don’t see where the raisins are to be added! Recipe loks delish..can’t wait to try it! Hi Selina, I am an idiot! Forgot to update the amended post. Now done. Thanks so much for bringing it to my attention!